Calcium is a key component to your overall health, helping not only to build strong bones but also regulating your body's electrolyte balance. Calcium -- like sodium, magnesium and potassium -- is a mineral, although it works best in combination with vitamin D. The average adult needs needs 1,000 mg of calcium daily, although the exact daily intake varies depending on age, gender and stage of life, such as pregnancy, menopause and perimenopause. 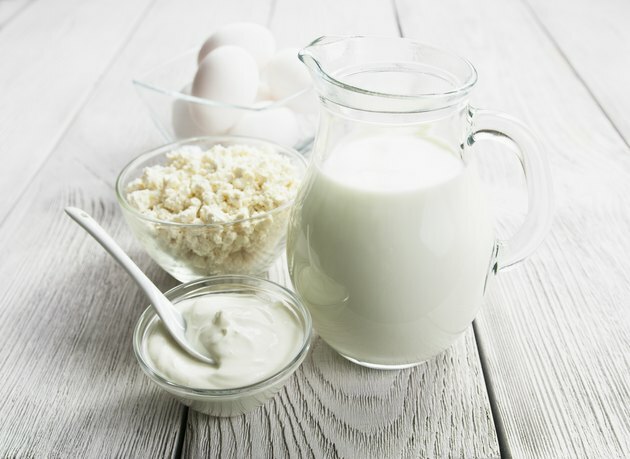 Research is mixed on whether taking calcium at night is more beneficial to your health; however, since nutritionists recommend splitting up your calcium intake to aid absorption, taking calcium at night can be helpful. Research the National Institutes of Health's recommendations for daily calcium intake. In general, calcium intake is higher in adolescents, which need the mineral for bone growth, pregnant women and menopausal women, at risk of osteoporosis. Keep track of how much calcium is in the foods you eat throughout the day. If you drink a glass of milk at breakfast and have cheese at lunch, you won't need as much calcium at day's end as someone who didn't have any calcium-rich foods. Limit your daily calcium intake to no more than 2,000 mg. Dr. Susan Ott, a professor at the University of Washington, says additional calcium puts unnecessary stress on the kidneys, which process the mineral. Split your calcium intake up between multiple meals and snacks. The intestines have a hard time processing calcium in doses higher than 600 mg.
Get your calcium either as a supplement or as food. Calcium carbonate and calcium citrate are the two most common forms of supplemental calcium. It doesn't matter whether you get your calcium from one of these supplements or from calcium-rich foods like dairy, almonds, broccoli and tinned salmon. If you choose a supplement, take it with food to aid absorption. Combine your calcium with vitamin D. Vitamin D helps aid in absorption of calcium in food and supplements. Avoid taking calcium with medications for iron or thyroid deficiency, as it can lead to dangerous interactions. Take calcium with fiber-rich foods and plenty of water if you are prone to constipation. Take your calcium -- either food or supplement -- at bedtime as a natural sleep aid. Mayo Clinic.com; When Should I Take Calcium Supplements? ; Katherine Zeratsky, R.D., L.D. Dr. Weil; Natural Cures for Insomnia; Andrew Weil, M.D.